From Scott Cooper, the critically-acclaimed writer and director of Crazy Heart, comes a gripping and gritty drama about family, fate, circumstance, and justice. Russell Baze (Christian Bale) has a rough life: he works a dead-end blue collar job at the local steel mill by day, and cares for his terminally ill father by night. When Russell's brother Rodney (Casey Affleck) returns home from serving time in Iraq, he gets lured into one of the most ruthless crime rings in the Northeast and mysteriously disappears. The police fail to crack the case, so - with nothing left to lose - Russell takes matters into his own hands, putting his life on the line to seek justice for his brother. 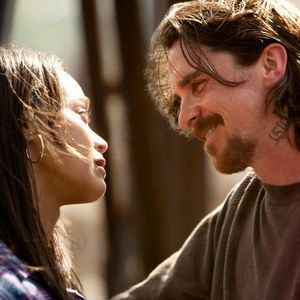 We have four new photos that spotlight stars Christian Bale and Zoe Saldana. Out of the Furnace is in theaters this December.